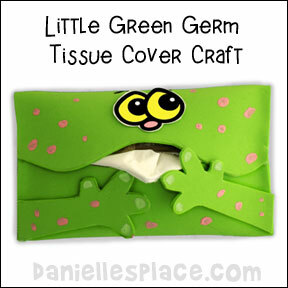 This little germ tissue cover will help children remember to use a tissue when they cough or sneeze. The printable tissue cover, arms, and six eye patterns for this craft are available to members. Children cut out the patterns, fold, and glue the envelope together and then glue on eyes and arms. To make the tissue cover sturdier you can use craft foam instead of paper. This color sheet is available to members. As your children color the sheet discuss how germs are spread and how to avoid getting sick. KidsBiology.com - Explanation of what a virus is and how it works. Educationworld.com - Germ experiment using different colors of glitter. Oralabs.com - How to protect yourself against germs. KidsHealth.org - What Types of Germs Are There? What Do Germs Do? How Can You Protect Yourself from Germs? 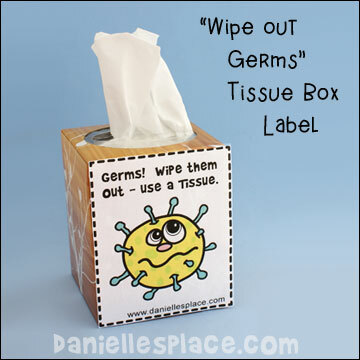 This is a great activity to help children remember to use a tissue when they sneeze of cough. 1. Visit web sites about germs: viruses, bacteria, fungi, and protozoa, and have your children look at microscopic pictures of the germs. 3. 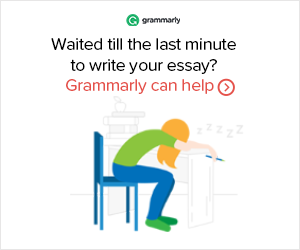 Have them write "Germs! Wipe them out; use a tissue." or something similar on the label, and glue it to the side of a tissue box. Children color the picture and then glue on a tissue and the arms to remind them to cover their mouths when they sneeze. 2. In class have your children color the picture and then cut out the arms. 3. Have them glue a tissue over the boys mouth and then glue the hands over the tissue. 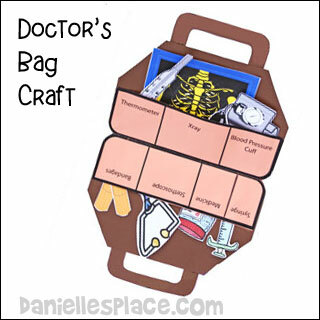 Use this doctor's bag craft to teach children about what doctor's do and the equipment they use. 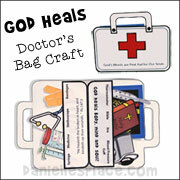 This is a great craft for children who might be nervous about visiting a doctor for the first time. Show your children each item in their doctor's bags and tell them what it is called and what it is used for. Challenge them to see if they can find the doctor's equipment on their next visit to their doctor's office. 1. 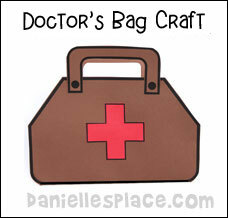 Fold a piece of brown construction paper in half and cut out a doctor's bag shape so that the bottom of the bag is on the fold. The bag will open like a file folder. 2. Cut two handles for the top of the bag from the same paper. 4. To make the insides of the bag trace the bottom half of the bag onto another sheet of folded paper. Cut it out and glue to the inside of the bag around the bottom and side edges to make two pockets. 5. Use clip art to print out medical supplies onto card stock. Cut them out and stick them in the pockets. Label the pockets where each item should go. This will help children learn the names of each item. You can also write the names of the items on each item so the children can match the items to the names on the pockets. 1. Print out the Nurse's Cap Pattern onto card stock and cut it out. 2. Color the cross red. Fold up the front of the cap and fold down the middle tab. Bring the two side tab over the middle table and staple them together. The first aid kit pattern is available to members only. See below. 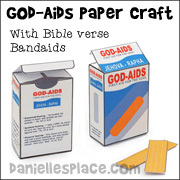 These bandages look like real bandages on one side, but contain a Bible verse on the other that will help heal people's souls. Children can give the bandages to people who need them. 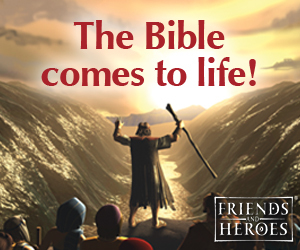 If there is a sad face on the bandage, they can give the bandage to someone who is sad, and the Bible verse on the bandage will help the sad person. There are "God-aids" for people who are sad, scared, worried, sick or hurt, and tired. This educational craft project comes with a printable "safety-aids" envelope pattern and ten printable bandages. Children cut them out fold them in half and glue them closed. Each bandage include a safety message. 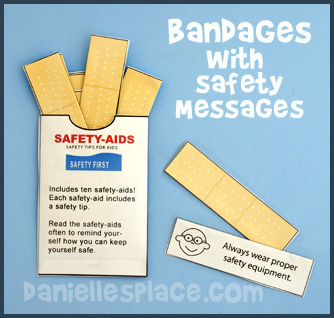 A blank bandage pattern is also available so children can write their own safety tips. 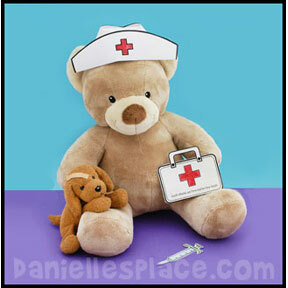 Children will love using this sheet to pretend play being a doctor or nurse. Print out the sheet and make copies. Provide a clipboard to attach the sheets and play medical supplies and demonstrate how each device is used so your children will be able to fill out the form. This paper first aid kit contains the same supplies as the doctor's kit craft above.